From Goodreads ~ It's the week before Christmas and antiques dealer Weezie Foley is in a frenzy to do up her shop for the Savannah historical district window decorating contest - which she intends to win. She throws herself into putting up a Graceland/Blue Christmas motif, with lots of tinsel, an aluminum tree, and all kinds of tacky retro stuff. The project takes up so much time that Weezie is ready to shoot herself with her glue gun by the time she's done, but the results are stunning. She's sure she's one-upped the owners of the trendy shop around the corner. But suddenly, things go missing from Weezie's display, and there seems to be a mysterious midnight visitor to her shop. Still, Weezie has high hopes for the holiday - maybe in the form of an engagement ring from her chef boyfriend. But Daniel, always moody at the holidays, seems more distant than usual. Weezie is an antiques pickers. She has been dating Daniel, a chef, for a while. Weezie love love loves Christmas and Daniel does not but he doesn't want to talk about why. 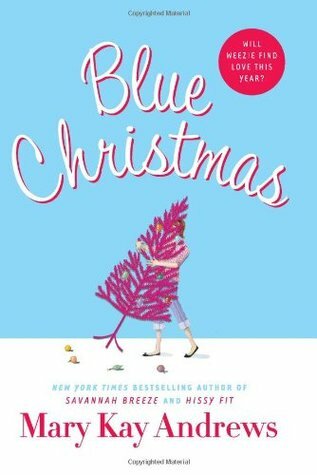 There is a contest to decorate store fronts and Weezie is determines to win and picks the theme of a blue Christmas for hers. In the meantime, funny things are happening to Weezie. When her dog, Jethro, get loose, someone returns him. Food is stolen from her fridge in her kitchen. Someone is leaving her gifts in her truck. A woman is seen sleeping in her store display. This is the fifth book I've read by this author (it is the third in the Weezie and BeBe Mystery Series ... I read the first couple in the last week) and I liked it ... it was a light read. It works well as a stand alone and you don't have to read the first one to know what's going on (the focus is more on Weezie in this one). I liked the writing style. It is written in first person perspective in Weezie's voice. There are recipes included at the end of the book. As a head's up, there is swearing and adult activity. I look forward to reading authors by this author.